The descriptions of the photographic terms listed below are general definitions and how they may relate to Light Painting Photography. This Light Painting Dictionary is by no means complete please contact me for terms that need to be added. 3 Essentials: To create a light painting photograph you need three essentials camera, tripod, and a light source. Auto Focus: Auto focus is allowing the camera to do the focusing for you. Generally you depress the shutter release half way to achieve auto focus. In light painting photography auto focus is rarely used. Ambient Light: The natural light of a scene. Some examples in light painting photography would be streetlights and the moon. AF Sensor: This is the sensor used to detect focus in the camera. Aperture: Also know as F-stop the aperture is the adjustable opening in the camera lens used to control the amount of light reaching the film or sensor. Backlight: Light that is coming from behind the subject of the photo. Batteries: Essential to light painting photography, batteries are used to power everything from the camera to the tools. Blur: Not sharp. Not focused. A blurry shot can ruin a night of light painting photography common causes are bumping the camera, wind, or excess movement of the subject. Brush: In Light Painting Photography a brush can be anything from a flashlight to a strobe. 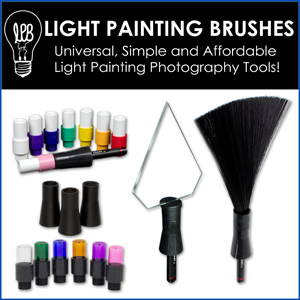 A brush can be used to write or paint with light. Bulb: Bulb is a shutter speed setting where the shutter stays open for as long as the shutter release is depressed. The bulb setting is also active when using a cable release or a timer remote control. Cable Release: A cable device used for releasing the shutter so that you do not have to touch the camera. Helps to reduce blur in light painting photography. Camera Painting: A light painting photography technique in which the camera is moved to create the design. Camera Toss: This is a kinetic light painting technique in which the artist opens the shutter and actually throws the camera into the air. This is one of the more dangerous light painting photography techniques. CMOS: Complementary Metal-Oxide Semiconductor. This is a type of image sensor. CMYK: Stands for Cyan, Magenta, Yellow, and Black. Color Balance: This is the accuracy in which the colors that are captured to the camera actually match the original scene. Color Temperature: This refers to the color of the light source. Color temperature is rated on the Kelvin scale. Color temperatures over 5,000K are known as cool colors, these would be the blues and whites. Colors with lower temperatures are called warm colors, these would be the yellows and reds. Contrast: Contrast is the difference in the light and dark values. The fewer gray values in an image the higher the contrast. Depth of Field: Also referred to as DOF, the depth of field is the distance between the farthest and nearest points that are in focus. Several different factors can affect the DOF such as focal length and aperture. Diffraction: Bounced light used in light painting photography to fill an area or to diffuse the light source. Diffusion: Diffusion is a material that softens the light source. In light painting photography diffusion is often used on flashes and torches. Dynamic Range: Is the ratio between the maximum and minimum measurable light intensities. light painting photography images will have varying degrees of dynamic range. Duct Tape: This along with gaffers tape can be your best friend in light painting photography. Duct tape is a pressure sensitive tape made of cloth. It can be used to make a light stencil light tight, fix a broken tripod, or hold a light in position. Exposure: This is the amount of light that reaches the film or sensor of the camera. Fill Flash: Fill flash is a technique by which the light painting photographer uses a flash to fill in a broad area with light. Think of this as your largest paintbrush. F-Stop: F-stops are the numbers located on the outside of a lens. They are the measurement of the aperture opening, the larger the F-stop the smaller the opening of the lens. The larger f-stop the less light will reach the film or sensor. The smaller the F-stop the larger the opening of the lens, this will allow more light to reach the film or sensor. In light painting photography higher f-stops allow for longer exposures and the use of brighter lights. Filters: Filters can refer to any number of items used to change the color or other characteristics of an image. Flare: Flare refers to the reflected light from lens elements. Lens flares happen in light painting photography when a bright light is used in front of or on-camera. Flash: Also known as a strobe. A flash is a light that produces a bright burst of light. Very widely used in light painting photography for numerous applications. Flash Box: Also known as a light stencil a flash box is used in light painting photography to create stencil type elements of light. A flash is placed into the back of the light tight box, when the light is flashed on-camera the translucent elements of the box are captured by the camera. Flashlight: This is by far the most common tool in light painting photography. A flashlight is a portable, handheld, electric powered light source. Flashlights are used for both on and off camera light painting photography. A flashlight is also known as a torch. Focal Length: This is the distance between the back of the lens element and the focal plane. Focal Plane: This is the area of the camera where the lens focuses on the film or sensor. Focus: Moving the camera in a way that creates a sharp image. Gels: Thin flexible sheets of polycarbonate of polyester. They are also known as colored gels or lighting gels they are used in light painting photography to produce colors when lights are shined through them. Highlights: The bright to white range of tones in an image. Gaffers Tape: A strong cloth, pressure sensitive tape similar to duct tape. Gaffers tape is preferred to duct tape in light painting photography due to the synthetic rubber adhesive that allows it to be removed without leaving a sticky residue behind. Histogram: A graphic representation of the range of tones from dark to light in a photo. Incidental Light: Light measured as it falls onto the surface, rather than reflected light. Illuminate: To light a scene in light painting photography. IS: Image Stabilizer. This feature compensates for camera shake. ISO: This is basically a measurement of film speed or the films sensitivity to light. Light painting photography is generally created at lower ISO settings to reduce noise. Generally the dimmer the light source the higher the ISO that may need to be used. JPEG: This is a standard for compressing image data created by the Joint Photographic Experts Group. JPEG is a known as a lossy format meaning that each time the information gets copied image quality is lost. Key Light: The main light source used to create a light painting photograph. Kinetic Photography: Is a light painting photography technique in which the artist opens the shutter for an extended period of time and moves the camera to create the desired image. Some kinetic photography techniques include shaking the camera, twisting the camera, and throwing the camera into the air, also known as a camera toss. LAPP: Stands for Light Art Performance Photography. LCD: Stands for Liquid Crystal Display. LED: Stands for Light Emitting Diode. LED’s are extremely popular among light painting photographers for their versatility, portability, brightness, and longevity. Lens: An optical device used to control and focus light. Lens Flare: Lens flare is a light element that will show up in your images usually when shooting directly into a strong light. For instance if you are creating a light drawing using a bright flashlight on camera and you shine the light directly into the lens it will produce a lens flare. The physical cause of lens flare is the reflection of light within the lens elements. Lens Hood: Put on the end of a lens to reduce lens flare. Light: One of the most essential elements in light painting photography. Light is electromagnetic radiation that is visible to the human eye. 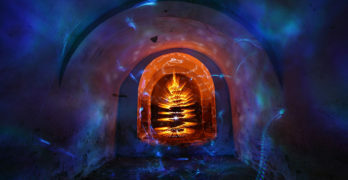 Light Art: Light Art is a form of visual art where the main medium of expression is light. Light painting photography is a form of light art. Light Art Performance Photography: Also known as LAPP is a performance with light that is captured by the open shutter of a camera. It could be said that Light Art Performance Photography is a specialized version of Light Painting in that the light movements are generally choreographed and rehearsed prior to the exposure. Light Bleed: Unwanted light that is showing through. Light bleed is a common occurance in light painting photography when using light stencils. Gaffers tape can solve this problem. Light Drawing: This is an art form where the artist generally uses handheld light sources on-camera to create light designs, the light drawing is captured to a camera using the photographic technique of long exposure photography. Also known as light graffiti and light writing. Light Graffiti: This is an art form where the artist generally uses handheld light sources on-camera to create light designs, the light drawing is captured to a camera using the photographic technique of long exposure photography. Also known as light drawing and light writing. Light Painting: Light Painting is an art form where the artist uses hand held light sources to selectively illuminate parts of a scene during a photographic exposure. The light painting art form is captured to a camera using the photographic technique of long exposure photography. There is no photo editing. All light painting images are created in real time and captured to the camera in one single photographic frame. Light Painting Photography: Light Painting Photography is an art form where the artist uses hand held light sources to selectively illuminate parts of a scene during a photographic exposure. The light painting art form is captured to a camera using the photographic technique of long exposure photography. There is no photo editing. All light painting images are created in real time and captured to the camera in one single photographic frame. Light Writing: This is an art form where the artist generally uses handheld light sources on-camera to create light designs, the light drawing is captured to a camera using the photographic technique of long exposure photography. Also known as light drawing and light graffiti. Long Exposure: This is the photographic technique of capturing an image by leaving the shutter of the camera open for an extended period of time. Most light painting photography can be described as long exposure photography. Long Exposure photography is also known as slow shutter and open shutter photography. Manual: Manual is a setting on higher end cameras that allows the photographer to have full control over the camera setting such as aperture, shutter speed, and white balance. A camera with manual controls will help you produce greater light painting photography. Manual Focus: Turning off the cameras auto focus and adjusting the focus for yourself. Manual focusing is the best way to create a sharp image in light painting photography. Megapixels: A megapixel is one million pixels. This number refers to the number of sensor elements your digital camera contains. Generally speaking the greater the number of megapixels the better the quality of the image your camera can produce. Also the greater number of megapixels your camera contains the larger you can print your images. Noise: Noise are the red, green, blue, or purple pixels that can show up on your image. These discolored pixels, or noise, appear when the camera’s image processor does not interpret them correctly. They are common in light painting photography. Neutral Density Filter: Also known as ND filters, they are dark, color neutral filters that are used as a way to control the amount of light reaching the film or sensor. ND filters can be used in day light painting photography or when the light source is extremely bright. Off-Camera: This is term describes a light source that is used to light the scene from either behind the camera or off to the side. The source of the light is not scene in the final image. On-Camera: This term describes any light source that is used to light the scene in front of the camera. A on-camera light source will be scene in the final image. Open Shutter: This is the photographic technique of capturing an image by leaving the shutter of the camera open for an extended period of time. Most light painting photography can be described as open shutter photography. Open Shutter photography is also known as slow shutter and long exposure photography. Over-Exposure: This is when the highlighted areas of an image lose their detail. In light painting photography this happens when the cameras setting are not correct or when the light source is to intense. Panoramic: This is an image that is more rectangular than a standard 35mm film frame. A 3:1 ratio is a good place to start for panoramic images. Photoshop: This word has no place in light painting photography. It is evil and should never be spoken. Pixel: A pixel is a picture element, a single point in a raster image. Digital photographs are made of millions of pixels. Prism: A piece of transparent material that is capable of bending light. Projector: A projector is a device that is used to project an image. Projectors can be used in light painting photography for patterns and other applications. RAW: Raw is an image format comprised of the data that comes directly off the image sensor with no in-camera processing. Reciprocity: This refers to the relationship between the intensity of the light source and the time that it has to react with the film or sensor. Recycling Time: This is the amount of time that it takes a flash to recharge so that it can fire again. RGB: Red, Green, and Blue. Saturation: The richness of the colors in an image. Sensitivity: This refers to the ISO. It is the measurement of the film or sensors sensitivity to light. Sharpness: The clarity of detail in an image. In light painting photography a sturdy tripod is essential to achieve a sharp image. Shutter: The mechanical device in the camera that controls the amount of time light is aloud to reach the film or sensor. Shutter Speed: This is the measurement of time that the shutter of the camera is left open. The slower the shutter speed the longer the exposure time. Light painting images can use shutter speeds of one second to several hours. Slave: A slave is a light sensitive device that is used to sync strobes and flashes with out the use of cords. Slow Shutter: This is the photographic technique of capturing an image by leaving the shutter of the camera open for an extended period of time. Most light painting photography can be described as slow shutter photography. Slow Shutter photography is also known as open shutter and long exposure photography. Soft Focus: This is an effect created by diffusing an image through the use of filters. SOOC: Straight out of Camera. A purest form of light painting photography is SOOC. Speed: This is the sensitivity to photosensitive material such as film or the image sensor. Also known as ISO. Spirograph: A spirograph is a geometric drawing technique that creates mathematical curves and shapes known as hypotrochoids and epitrochoids. In light painting photography spirograph images are created with a light source hanging from a string. Stencil: In light painting photography a stencil is an image cut out of some material that is light proof and allows light to only penetrate thru the sections that are cut out. Creating a physical negative. It is the same technique used in street art only instead of paint, light painters use light. Sticks: Sticks are another word for tripod. Strobe: A strobe is also called a flash, generally strobes are off camera light sources and are more powerful than a standard flash. Tack Sharp: A tack sharp image is one that is sharp even when viewed at its largest size. Timer Remote Control: Much like a cable release this is a remote switch that allows the photographer to open the shutter without touching the camera. A timer remote has additional features such as a self-timer, interval timer, long exposure timer and an exposure count setting. Tone: This is the measurement of gray values in a photograph. Torch: A torch is a portable, handheld, electric powered light source. Torches are used for both on and off camera light painting photography. Torches are also known as flashlights. Tripod: One of the three essential for light painting photography. In light painting photography a tripod is a 3 legged device used to hold the camera steady while the shutter is open. Tripods are also known as sticks. Tungsten: Tungsten refers to the metal filament used in light bulbs. When electrical current is applied tungsten bulbs give off a reddish/yellow colored light, great for creating warm feeling light painting photography images. Under Exposed: This happens when too little light reaches the film or sensor. The results of an under-exposed image in light painting photography are a dark image. Viewfinder: The optical viewing device for framing and focusing in a camera. Vignetting: This is when you create an image and there are dark spots on the outside edges. Vignetting can be cause by several different factors such as improper lens fitting or filters. White Balance: In light painting photography white balance refers to the color temperature of the light source. The temperature of the light source is rated in Kelvin degrees, the whiter the light the higher the temperature. Most higher end cameras will offer you several preset choices for your white balance as well as letting you select a custom white balance. Wide Angle Lens: A wide angle lens allow the artist to capture more of the image from a close disance. As a general rule if you are shooting with a DSLR 35mm camera a wide angle lens can be described as any lens under 50mm. Zoom Lens: A zoom lens is a lens that has a variable focal length. Zoom lenses can be used in light painting photography to create color streaks on skylines as well as various other applications.